The idea of sweet and spice works well in savoury dishes – this is a tenet in Thai and Indonesian cuisines. Sweet and spice elements within a dish create balance. Spice, spice blends like yaji (suya spice which is nutty and flavourful) counteract the sweetness in this dish, from ripe plantains. Nigerian cuisine also understands this balance well. 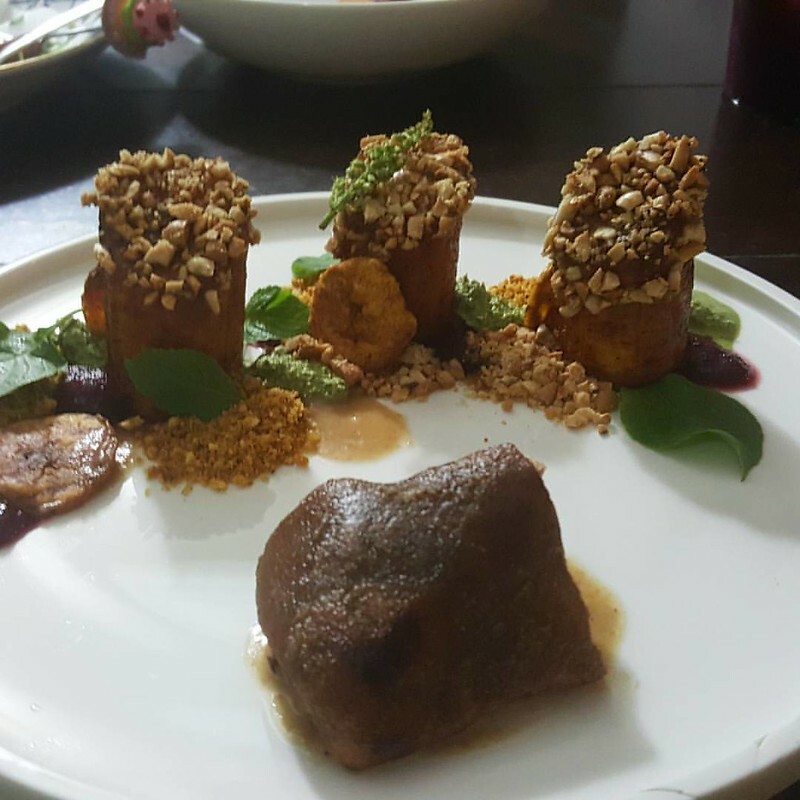 It is reflected in dishes like Ukwaka – ripe plantain moinmoin which can be overwhelmingly sweet in taste and monotonous in texture, where it not for the chilies which are added to cut through that sameness and accentuate other delicate flavours. This is the premise for this dish. I must apologise for the photos, made with my phone. For the plantains, I wanted to make ‘towers’, so I cut each plantain in 3/ 4 sections along the length. I made one end flat, and the other slanted. I deep-fried till golden. 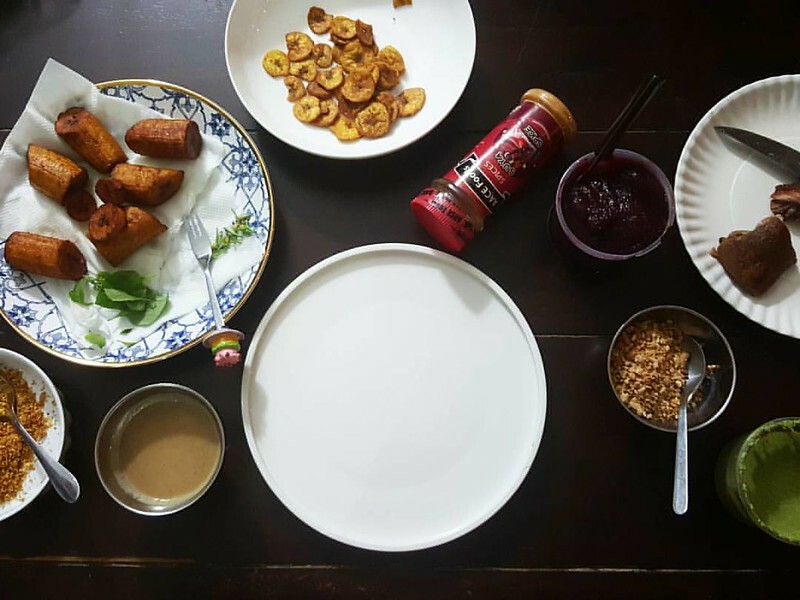 To plate, I dipped the plantains in the peanut butter sauce then in the crushed peanuts. These were arranged in an arc on one side of the plate. 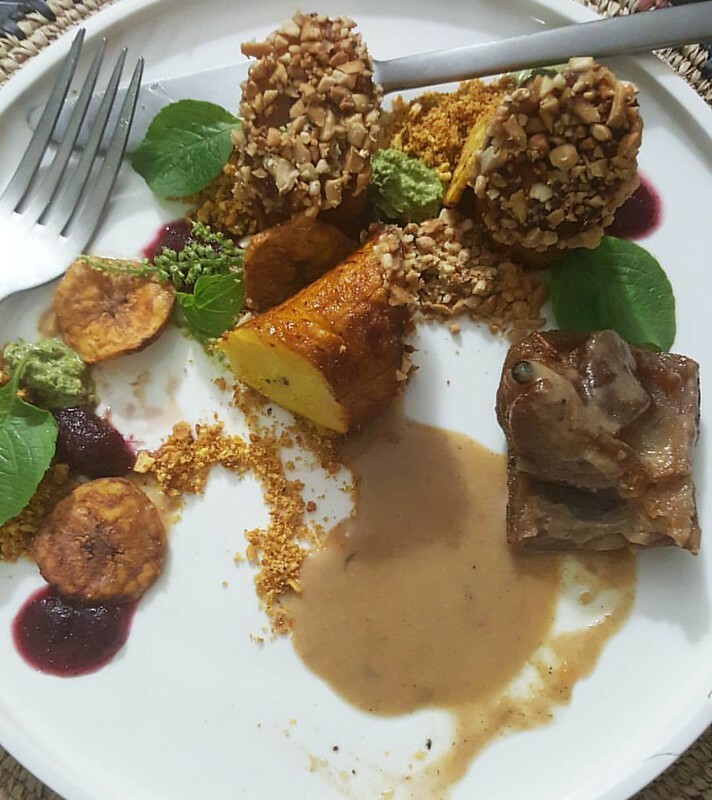 Around each one, I placed some plantain chip crumbs, and crushed peanuts with dollops of scent leaf sauce and zobo pepper sauce, then finished with scent leaves. Some goat confit went on the other side, in a small pool of peanut butter sauce. The end result was delicious! Sweet, spicy, nutty, with a bit of fruity and herby from the zobo and scent leaf sauces. The crushed peanuts and plantain chip crumb brought some textural relief to the softness of the plantains. I really, really enjoyed it. 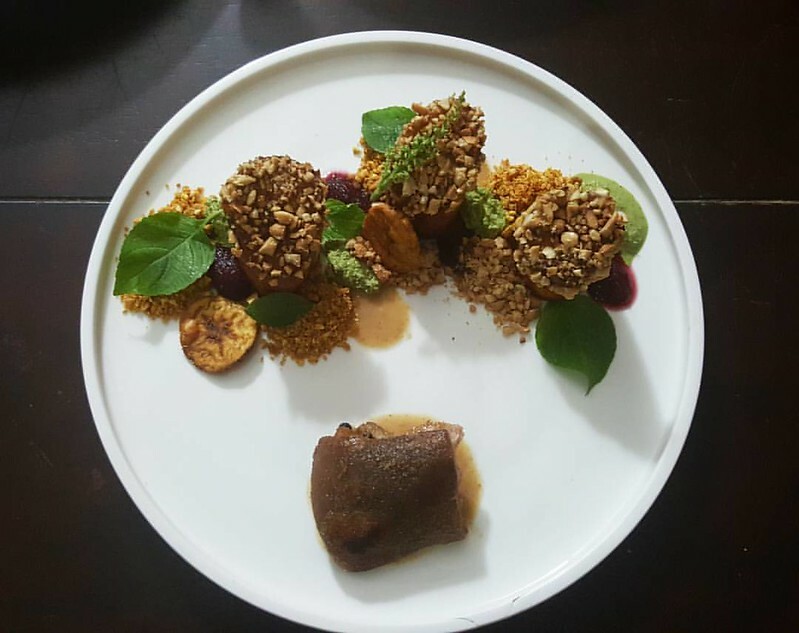 Yes, the goat confit was a touch too salty but the whole combo was great – well balanced and flavourful and definitely in the realms of Nigerian cuisine as Fine Dining.